•	Take frequent breaks; don’t type for more than three minutes at a time. •	Keep your messages short and simple; use the auto-complete or word prediction features. •	Save non-urgent emails for your computer keyboard. •	Pay attention to pain; purchase wrist or thumb support to help stabilize the area affected. •	Keep your wrists straight and your grip neutral when texting. •	Use alternating fingers—not just your thumbs. •	To avoid hunching, retrain yourself to hold your arms out and look straight ahead. •	If you must look down, gently tuck your chin in, don’t protrude it forward. 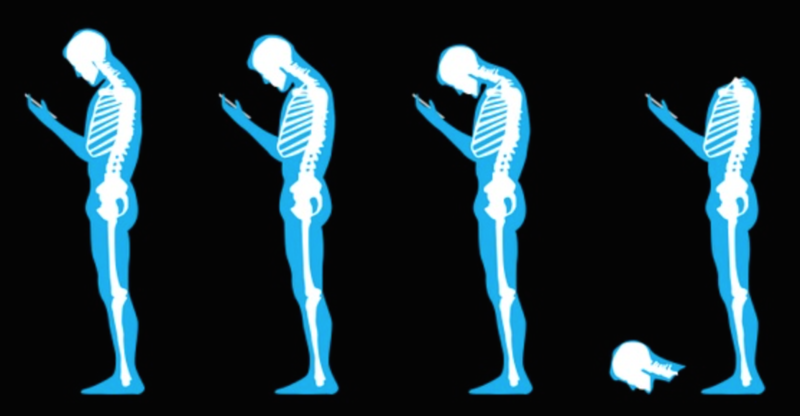 •	Help counter the effects of text neck with regular chiropractic adjustments. •	Rest your forearms on a pillow when texting to help minimize tension. •	Sit up straight, chest up and shoulder blades back and down, and keep your head back; your ears should align with your shoulders. •	Use a hands-free device when talking on the phone; avoid holding the phone between your ear and shoulder. •	Center your monitor directly in front of you and raise it to just above eye level. •	Keep your elbows, hips and knees at 90-degree angles, and your feet parallel to the ground. Use a footstool if necessary. •	Again, sit up straight with your shoulders and head back, aligning your ears with your shoulders. •	Remove watches or bracelets that interfere with typing or using the mouse. •	Get up and move around for short breaks each hour; walk away from the computer. •	Take micro-breaks often, at least every 20 minutes. Shake out your arms, stretch your wrists and focus your eyes on something 20 feet away for 20 seconds to help you refresh. •	Receive regular chiropractic adjustments; ask Dr. Stewart or Dr. Kirkpatrick to demonstrate some helpful stretches.